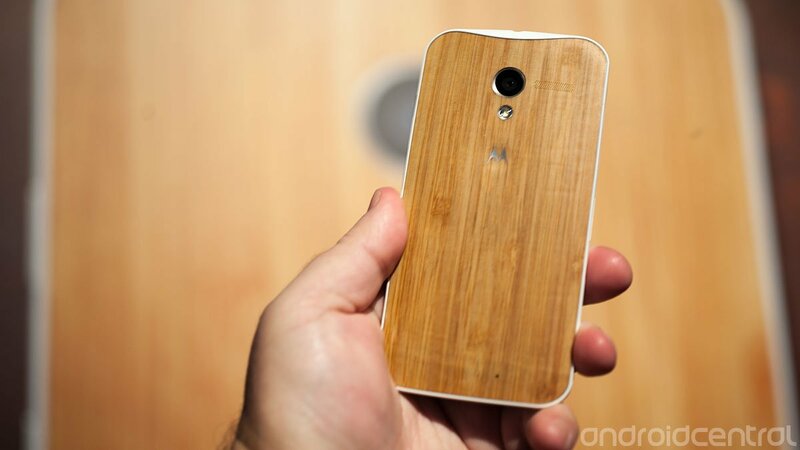 The Moto X is nice ... but does it come in wood? There are some 18 different backs from which you can choose when you're customizing your Moto X. Colors out the wazoo. Wood is not yet one of them. But it will be. Motorola currently is testing four wood backs for the Moto X. Not "looks like wood." Not "simulated wood." Actual wood. And you know that? It's kind of awesome. You get the wood look, and the wood feel. Again, because it's wood. As you'd expect, there are new challenges when you're starting to use organic material in smartphone manufacturing. Different varieties have differing RF properties, Motorola's Rick Osterloh, senior VP of product management, told us in a group briefing. As for sustainability — a hot topic any time you talk about using a natural resource — well, he dodged that one. But let's hope Motorola's got a better answer for that one when wood panels are available as options later this year. Moto's currently testing four wood options — rosewood, mahogany, teak and bamboo.